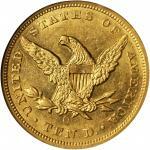 1855-O Liberty Head Eagle. 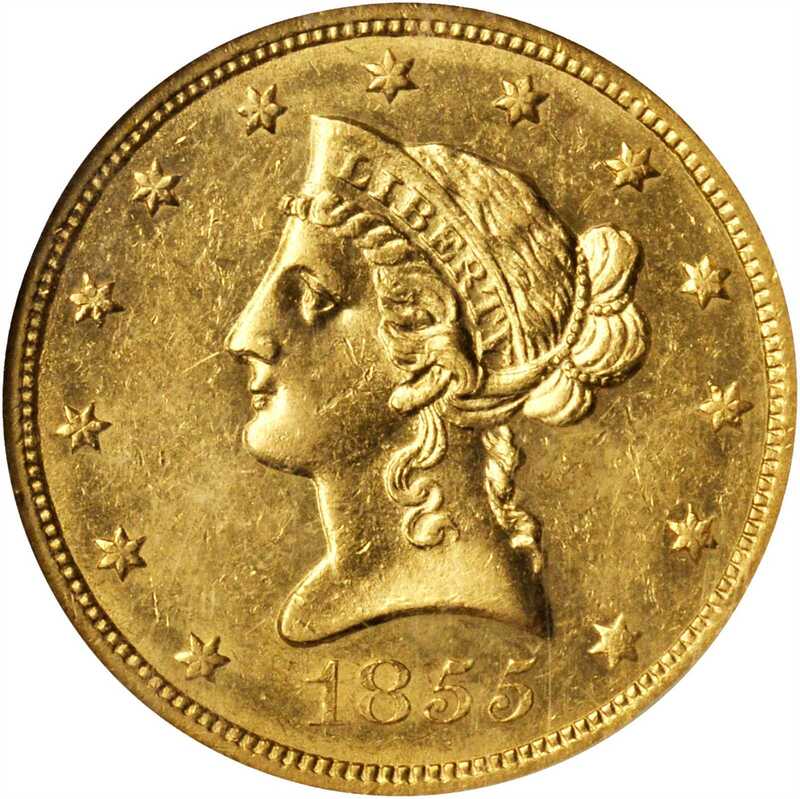 AU-55 (NGC).Satiny bright yellow-gold surfaces offer outstanding eye appeal for a lightly circulated No Motto Liberty Head ten from the New Orleans Mint. The central devices are predominantly sharp in striking detail, the peripheries bold apart from bluntness to the obverse stars. Pleasingly smooth in hand, and sure to see spirited bidding among advanced Southern gold collectors. One of the leading rarities among New Orleans Mint eagles, the 1855-O is a low mintage affair with just 18,000 coins struck. Survivors are similar in rarity to those of the 1852-O, 1856-O and 1857-O issues, and they typically grade no finer than EF. Recent shipwreck finds have not significantly increased the supply of high grade examples, only seven or eight 1855-O eagles included among the treasure of the <em>S.S. Republic</em>. With Mint State coins all but unknown, this impressive Choice AU would serve as a highlight in an advanced gold cabinet. This lot includes the original wooden presentation box for the coin, slipcase, and informational packet as issued by Odyssey Marine Exploration, salvagers of the S.S. Republic treasure. <strong><em>The supporting items are available to the winning bidder upon request to Stacks Bowers Galleries at the close of the auction</em></strong>.From the Paisley Acres Collection. Earlier ex <em>S.S. Republic</em>.